You’ve decided to remodel your kitchen, but now you need to determine what changes you’ll make and where best spend your money. How you repair will significantly depend on your goals. More storage space or better functionality will all influence your remodel. Once you’ve decided to make the changes, you may need little extra financing. If you’re looking to make the transition sooner rather than later, consider a cash-out refinance. With home values increasing, you can refinance for a little extra and put that cash directly into remodeling your home to increase its value further. We’ve put together some ideas to get the creative remodeling juices flowing. Open floor plans are still popular because they let everyone be together no matter where they are in the living space. The cook is in the same area as the guests. Taking out a non-load bearing wall or creating a half wall can be enough to open your kitchen space to an adjoining dining or family room. You can still keep the two areas seamlessly blended through furniture placement and design, but space itself will feel more open and welcoming. Add an island that can take part in all the functions of the kitchen. There should be extra seating but also enough space to devote some countertop to preparing or serving food. Don’t forget about storage space underneath. If you’re daring, consider a long island that doubles as a dining space for the whole family. The more purposes the island can serve the more you’ll use it. The pantry is one of those areas you can’t live without but often gets forgotten. If your current kitchen doesn’t have much for pantry space, consider how you can carve out some extra room. Could you expand your current pantry by removing a closet or by using some space from the dining area or living room? Once you’ve found the space you need, design it carefully. Shelving and ease of access will play a significant role in how convenient it is for you to store and manage food. A good sink can add value to your home. Double sinks work well because you can have one sink for washing and one for rinsing. If you’re feeling adventurous, add a small second sink to wash hands, produce, or fill water glasses while using the main sink. At first, it might seem strange to create a dedicated study area in the kitchen. However, kids are usually doing homework while parents are making dinner. Having them nearby where you can help them makes it easier to cook and parent at the same time. A built-in desk next to the kitchen can also serve as your command center where you pay bills, organize schedules, and keep relevant paperwork filed. A welcoming kitchen is a well-lit kitchen. Skylights not only let in natural light they can also reduce electricity use. You can also put in more massive windows or possible a French door to the outside. Adding recessed lighting or lights over an island bring comfort and build a relaxing atmosphere. Drawers and cupboards can hide all kinds of organizational features to make cooking easier. A dishware drawer has evenly spaced holes wherein you can place corner pieces that you can stack within in the drawer. Having plates down low gives kids easy access. Faux cabinet doors can be used to hide multilayered drawers for pots, lids, and other ample cookware. Some faux doors can even conceal the garbage and recycling, so you don’t have to keep them in the open or under the sink. 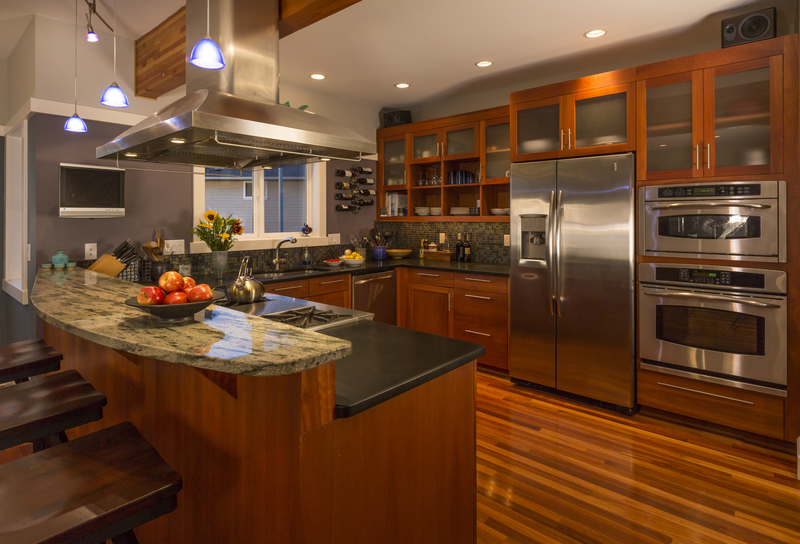 A kitchen remodel can increase the value of your home and make your kitchen more functional. Think it through, consider your needs, consult a professional, and then get started on creating the kitchen you’ve always wanted. See Guy Hassell for more information.